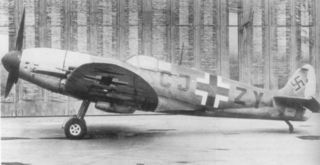 During trials of captured Spitfires in Germany, one aircraft was equipped with a German DB 605 engine. It was later destroyed in an Allied air raid. In November 1942 a Spitfire VB EN830 NX-X of 131 Squadron made a forced landing in a turnip field at Dielament Manor, Trinity, Jersey, under German occupation at the time. This aircraft was repairable and started being test flown in German markings and colours at the Luftwaffe's central research facilities at Erprobungsstelle Rechlin. There it was proposed that the Spitfire's Merlin engine should be replaced by a Daimler-Benz DB 605A inverted Vee-12 engine; the Spitfire was sent to Echterdingen, south of Stuttgart, where Daimler-Benz operated a flight testing division. When the Merlin engine was removed it was discovered that the fuselage cross section was virtually identical to that of the engine nacelle of a Messerschmitt Bf-110G. Consequently a new engine support structure was built onto the Spitfire's fuselage and the DB 605 engine and cowling panels added. A propeller unit and supercharger air intake from a Bf 109 G completed the installation. Other changes made were to replace the Spitfire instruments with German types, and to change the 12-volt electrical system to the German 24-volt type. In this form the Daimler-Benz Spitfire started flying in early 1944. It was popular with German pilots and was flown regularly until destroyed in a USAAF bombing raid on 14 August 1944. This page was last modified on 8 October 2016, at 12:01.